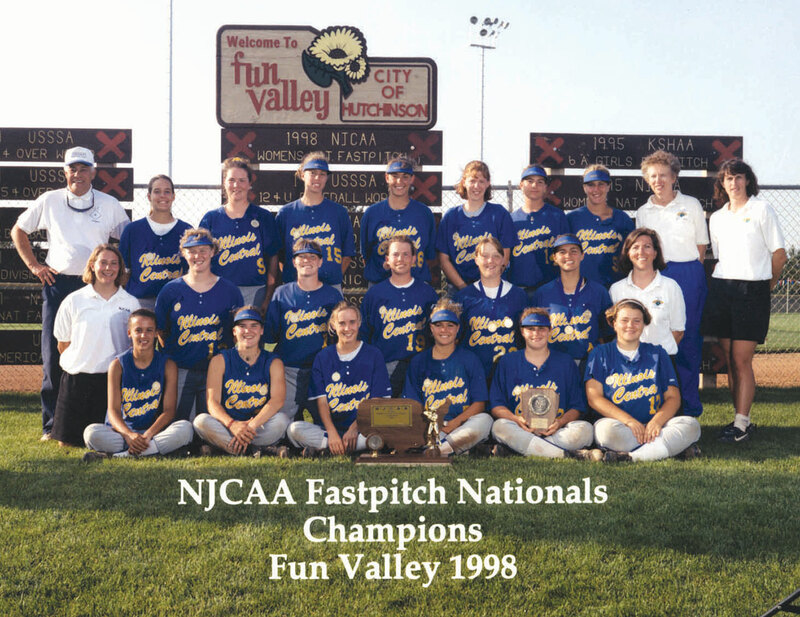 Head Coached by Lorene Ramsey and Assistants, Sue Sinclair, Tom Gilles & Shelly Lindsay, the 1998 Lady Cougars captured the 2nd National Junior College Athletic Association (NJCAA) Tournament Championship in ICC’s history. In addition to a convincing win (8-0 in 5 innings) over perennial power, Central Arizona (winner of 7 of the previous 10 national titles), ICC defeated 4 other teams, Charles County (MD), Ricks College (ID), DeKalb Community College (GA), and Gulf Coast Community College (FL). Outscoring their tournament opponents, 31-5, ICC won 7 games including 3 games on the final day. The Lady Cougars shutout Ricks in the last 2 games (double elimination) by scores of 6-0 and 5-0. ICC players on the All-Tournament team at the national tournament were: Cathy Peverly (ss), Kelly Grigsby (3rd), and Melissa Cassidy (pitcher). Cassidy was also selected as the Most Valuable Player of the tournament. All-American selections included Peverly, Ashley Blust, and Nicole Kurth. Faced with exceptionally strong competition during much of the season, the Lady Cougars finished 1998 with a 46-9 record.